A solid card game with a patina of zombie fun. The mechanics are simple and easy to learn, but it takes a little while to learn the menus. Lord of the Fries is a trick-making card game for 3-8 players. The idea is that the players are zombies in an unholy fast food restaurant trying to fill orders. Each card represents an ingredient and each order requires a different combination of ingredients to fill. For example, the Chickacheezabunga at Friedey’s Restaurant consists of one Bun, one Cheese and one Bird card. Lord of the Fries is on its third edition now. The original edition was an envelope game from Cheapass Games. The color special edition from James Ernest games has higher quality, full color cards and adds extra cards and menus for more variety between games. The third edition from Steve Jackson Games includes larger menus, more cards, tokens and dice.First decide which restaurant you are going to play, as each has a different menu and requires a different deck, ranging from 54 to 80 cards. The deck is shuffled and completely dealt out so that each player has more or less the same number of cards. Each turn, the lead player either “calls” an item from the menu to be filled, or “rolls” an item. Play starts from the leader’s left and proceeds around the table. A player can either fill the order by placing the necessary cards in front of them or “pass” on the order. If a player passes, then they give away one card, either to the player on to the left if the item was called, or to the leader if the item was rolled. If a player fills the order, then they place those cards face up in front of them. The player who fills the order takes over as leader. The game ends when one player is out of cards. A player’s score is the total value of the cards they have played to fill menu items, minus the total value of the cards left in their hand. Once every player has taken a turn being dealer, the scores from each round are added up to determine the grand winner. At the start of the game, it’s worth rolling items rather than calling them so that you can accumulate the cards needed to fill the bigger orders. Once you have the cards to fill the more complex orders, you can call them with less risk that somebody else will be able to fill it before you. It takes a while to get to grips with the items on a menu, especially since the menu cards are small and tightly packed with text. It’s probably worth it to play the original Friedey’s menu for a while before moving onto one of the other restaurants. The Lord of the Fries cards are good quality and they are very nicely illustrated by Brian Snoddy. The “calling” vs “rolling” dynamic introduces some nice unpredictability into the game. The zombie theme is just window dressing, but it’s good window dressing and zombies are a welcome addition to any game. 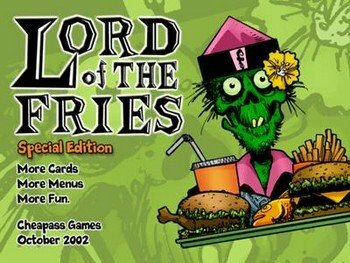 Once you strip away the zombie trappings, Lord of the Fries is a fairly traditional style of card game. Since people already tend to know what “straights” and “flushes” are, but don’t know much about the Cheezabunga or Chickbunga Conga, there’s a learning curve to get to grips with the deck and the menu. It may not be a good fit for strategy fans, but it’s a good way to get card game players into something a little different. Lord of the Fries plays smoothly and it’s definitely worth a spot in your rotation. Compared to something like Give Me the Brain, it’s almost respectable. That can make it an easier sell to more traditional gamers, but it does mean that it’s not quite as entertaining for those of us who like to put on zombie voices.